For anyone who tried to write to me at any of the mommymonster.com addresses… there’s been a bit of a mix up. My host, who ordinarily I love and who usually does things quietly and unobtrusively behind the scenes with nary a ripple… my host decided to upgrade the mail servers. Now, this is a good thing. Really. And the upgrade went not too badly. But… as it was explained to me… for some reason mommymonster.com mail got pointed to the wrong place, and so all incoming mail made it to the server and then went… into a black hole. I could send mail, but not receive it. Eventually my mail was pointed to the right place, and now is delivered without a hitch. Bottom line: No mail reached me between approximately midnight last Friday (10/06) and yesterday (10/09) morning at around 8:00 AM (all times PDT). If you sent me any mail… I’m not ignoring you. I have no way of knowing who you are or what you sent. Please, please please resend! Unless you’re a spammer. Then don’t bother. I have plenty of replacements in my inbox. See? I haven’t knit so very far on #1 Son’s blanket. Just a short way. Just enough for a little bit of a sock breather. This is Karabella Aurora 8 Space Dyed in colorway 18. Pretty stuff, isn’t it? I love how this knits up, too — very soft and springy. Sorry for the flash pic. There’s no light yet today. I tell you, after all of the socks I’ve been knitting this year, US#9 needles feel like broomsticks. I have made some progress on Socktober Socks #1. Another inch or so. It comes by slow degrees. I don’t know that I’m ever going to love these socks. But what matters is that the recipient does. Alice had asked awhile ago if #1 Son likes his socks. He does indeed, and I am happy to report that they fit perfectly! I bow down to the long, long ago knitster who invented ribbing. It just cures a myriad of ills, doesn’t it? I’m hoping the socks will keep his feet warm on tour – he leaves next Friday and won’t be back until just before Thanksgiving. This tour is with what I think of as his other band – i.e the one he joined second. If you’re interested in the tour dates, this page has a map (loads really slow in IE, but OK in Firefox). For some reason the outbound trip is to the south, and they are coming home across the north. I would have planned that the other way. But what do I know? Iâ€™m interested to know how you go about changing a pattern from cuff down to toe-up. Well… sometimes I don’t. I have my own tried-and-true toe-up pattern that I call my sock non-pattern, and which I knit using a variety of toes and heels and stitch patterns. But, assuming that I wanted to deconstruct a cuff down sock, I would start with the stitch pattern and see if it can be worked backwards (some can) or must be worked as written. Ribbing, cables, and wavy stitches like feather and fan can often be worked in either direction. Lace can only be worked in one direction. 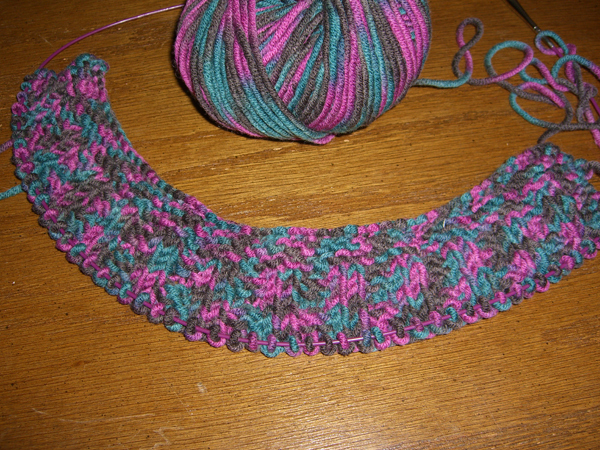 If I’m not sure if the stitch can be worked both directions, I might swatch it both ways. To work it “backwards,” I start with the last row in the pattern and work to the first row. I will often just look to see if I can impose the stitch pattern (backwards or forwards) over my own sock. If that looks like it would work, I might not go any further. I would just choose a toe and a heel and go for it. If the cuff-down pattern has some tricky construction (read that: I want to figure out how they did that), or looks a lot different from my standard sock, I start reading the pattern backwards, just like with the stitch pattern. I start first with the toe construction — does it have a wedge toe? Or a star toe? Does it decrease every other row or every row? Sometimes the toe can’t be worked backwards, so then I substitute a toe from my own bag of tricks. I do the same thing with the heel. Sharon Hurlbut reports that the cow I saw wandering around The Streets Of Tanasbourne was none other than Maggie Moo. Whodda thunk it?